When Jennifer Trafton started thinking about her next children’s novel, she began picturing a young Don Quixote who saw the world a little differently from everyone else. And like Don Quixote, this character—an eight-year-old boy named Henry—would have a quest to fulfill: to share his vision and his artistic gifts for the benefit of the wider community. Trafton can relate well to Henry of Henry and the Chalk Dragon because his story reflects her own artistic journey. Like Henry, Trafton’s experience as an author has been shaped by friends and family who encouraged her along the way, as well as through thoughtful collaboration with fellow artists and writers. “In collaboration and community, we end up creating something we couldn’t do alone,” Trafton said. But Trafton wasn’t the only one finding creative nourishment from all the collaboration and support. Others, including Benjamin Schipper, enjoyed and benefitted from Trafton’s willingness to collaborate with them. Trafton found Schipper through a community member’s recommendation, and he became the illustrator for Henry and the Chalk Dragon. “I loved working with Jennifer and the Rabbit Room Press especially because they gave me so much creative freedom, from illustrating it the way I wanted to designing the type/title and laying out the [book jacket],” Schipper said. His part of the creative process began with reading the book and pulling out striking imagery in the story. He then sought the best way to render those images. For Henry and the Chalk Dragon, Schipper tried to draw images that would look like something young Henry would draw himself. Schipper used the same pencil to draw the black and white interior illustrations, and he wanted the dragon on the cover to look like it was drawn with chalk. “I think it all came together very nicely, and the whole thing feels like an art object to me,” Schipper said. Working in community with people who could give her honest feedback and provide her with emotional and spiritual support during the writing process hasn’t always been part of Trafton’s creative process. She often found herself working alone when she wrote her first children’s book, The Rise and Fall of Mount Majestic, which was published in 2010 by Puffin Books and illustrated by Brett Helquist. But her situation changed significantly when she created Henry and the Chalk Dragon. Writing her second children’s novel coincided with becoming involved and welcomed into The Rabbit Room, a Nashville, Tenn., community of artists, musicians, and writers. She ended up marrying one of the group’s cofounders, and she was inspired by the community’s many songwriters and musicians who were carving their own creative paths, many times without a record label. And whenever Trafton experienced fears, struggles, or self-doubt as she was writing Henry’s story, people kept speaking truth to her by affirming her value as a writer and an artist. For instance, a number of people in the Rabbit Room community ended up being readers in the early stages of the book, and she received helpful feedback from readers with children who were the age that Trafton was trying to reach. She also read some chapters of Henry and the Chalk Dragon at a conference sponsored by The Rabbit Room. Trafton said it was encouraging and powerful for her to read aloud those excerpts and hear the audience’s laughter and their responses being mirrored back to her. “That experience of community filtered into the story in ways I didn’t intend,” she said. Another of Trafton’s collaborators for this project was Lanier Ivester, a friend and writing partner who said her relationship with Trafton isn’t only about writing, but also about support and accountability through encouraging text messages and prayer. They hold sessions on Skype and FaceTime too where they’ll relay their rewards and penalties for meeting—or missing—weekly writing goals. “Jennifer has become a safe place for me when I fall prey to the voices in my head telling me my work is terrible or that it doesn’t matter,” said Ivester, who first met Trafton in 2010 at Hutchmoot, an annual gathering of The Rabbit Room community. As Ivester watched Trafton write Henry’s story, she was struck by Trafton’s vulnerability and honesty and her desire to write a story that encouraged others to be brave enough to share their artistic gifts with the wider community. “I learned so much from Jennifer’s humility during that process—she made it clear that she was committing her manuscript at that stage to a few trusted friends because they knew her heart, but also because she knew that they loved her and her work too much to be anything but honest with her,” Ivester said. 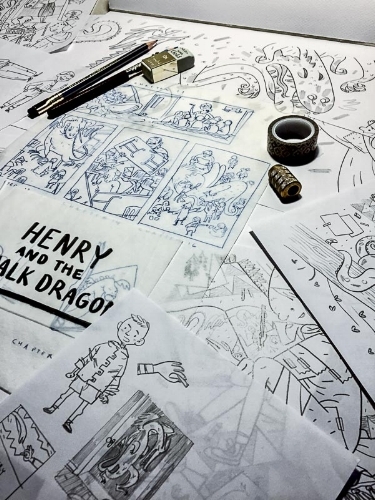 With the release of Henry and the Chalk Dragon this month, Trafton hopes to impart upon her readers the truth that they have something meaningful to contribute to society. “I hope the book will encourage readers, young and old, to embrace their own unique imaginations without fear and to create something new and beautiful to send out into the world,” Trafton said. Ivester says readers will be inspired to pursue Trafton’s message, given the care and devotion that she has taken to write Henry’s story. Jennifer has “honored her imagination, she’s loved what she made, and she’s set it free for a life of its own in the world. And she’s done this, not in the absence of fear, but right in the very face of it—which, as far as I’m concerned, is the bravest thing there is,” Ivester said.